News Highlights | Nano, solar and other KurzweilAI.net news filed under: business, science, technology — tags: graphene, KurzweilAI.net, nanotechnology, nanotubes, quantum computer, self assembly, silicon, solar energy — davidkirkpatrick @ 3:39 pm. Different format today for the KurzweilAI.net newsletter highlights. There is so much good stuff I’m dropping bits directly from the newsletter. Today features solar, stretchy silicon, quantum computing news, self assembly, electricity producing nanotubes, and a possible successor to silicon — graphene. Do follow the links. 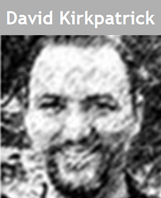 About David Kirkpatrick | David Kirkpatrick is a writer of fiction, business and journalism. His published work includes newspaper and magazine journalism, website content, full-length ghosted nonfiction, marketing communications and short fiction. His client list includes USA Today, the American City Business Journals family, Oxford Intelligence, BootlegSports.com, Office.com, LocalBusiness.com and C-Level Media, among many others. Follow David on Twitter.